WARNING: Do NOT read this post if you are a child, have a weak stomach or love sheep. REALLY. I’M NOT JOKING. This interlude may have scarred Patti for life and instead of remembering the cuddly Panda’s we saw at the zoo, she’ll never forget the sheep doomed to die. That being said, it is China and as we say here, you can die fast or you can die slow. The sheep unfortunately had to go the route of the former vs. the latter. 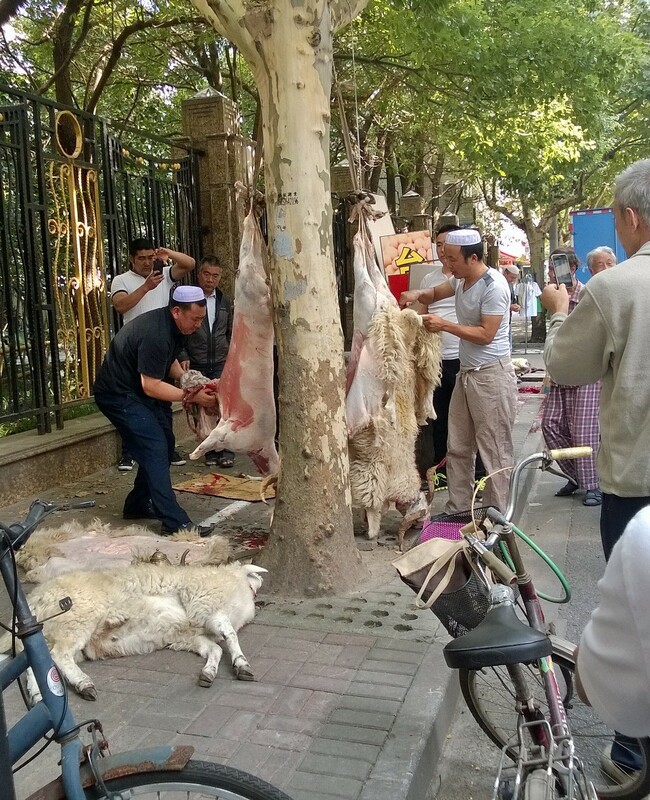 While strolling as a group to the local wet market as part of our cooking class, little did we know we were going to witness a ritual to celebrate Eid al-Adha, the feast of sacrifice. NOOOOOOO…we thought we would pick up some ingredients for our lovely lunch and then merrily skip back to Helen’s apartment for our class. Along the way we saw the cutest sheep tied to the fence so we stopped to take some photos. 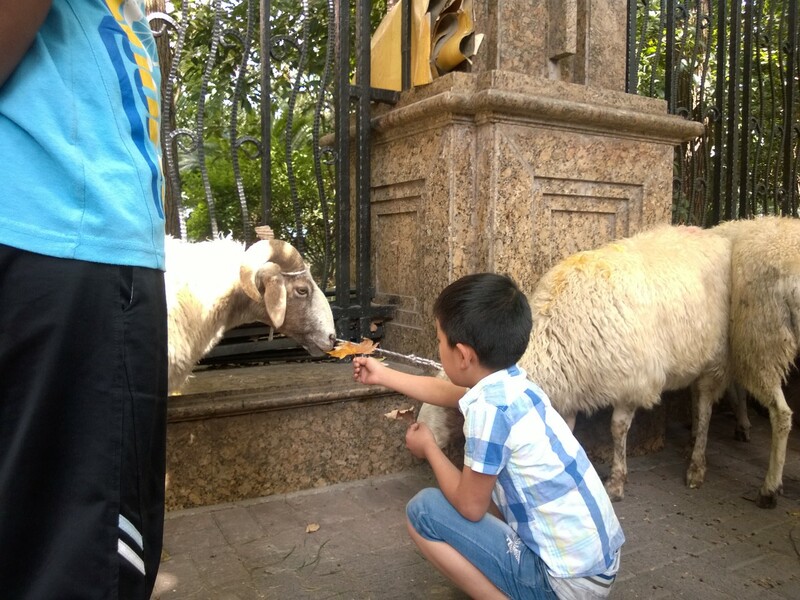 It’s not often you see live animals in the streets of Shanghai, so I had to take a photo of the boy feeding the cute sheep a leaf. Little did I know that would be his last meal on Earth. Coming out of the market, we saw a group of people with their phones out taking pictures. As we got closer, we saw that the cuddly sheep had been sacrificed and were strung up by their hooves and were being butchered right there on the street IN FRONT OF CHILDREN! While Emily, the vegetarian in our cooking class, quickly ran away screaming, I felt I had to document what was the most gruesome sight I have ever seen. If I wasn’t somewhat of a vegetarian before, I am now. Thom quickly informed me as he shot photos, that this must be the hajj faithful offering a sacrifice by slaughtering a sheep with the meat going to the needy. In the Shanghai Daily, Thom had read an article on the festival that 1.5 billion Muslim around the world celebrate. While I respect the culture, it was shocking to see it played out in public for all to see. 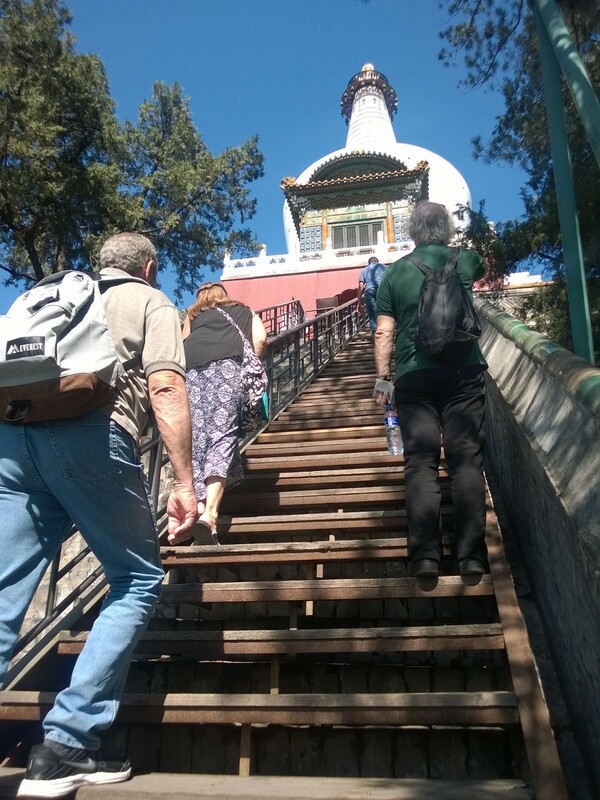 But that’s why I came on this adventure-to experience new and different cultures–so it was fitting that I witnessed this while still in China. Still, the sheep were so cute…. 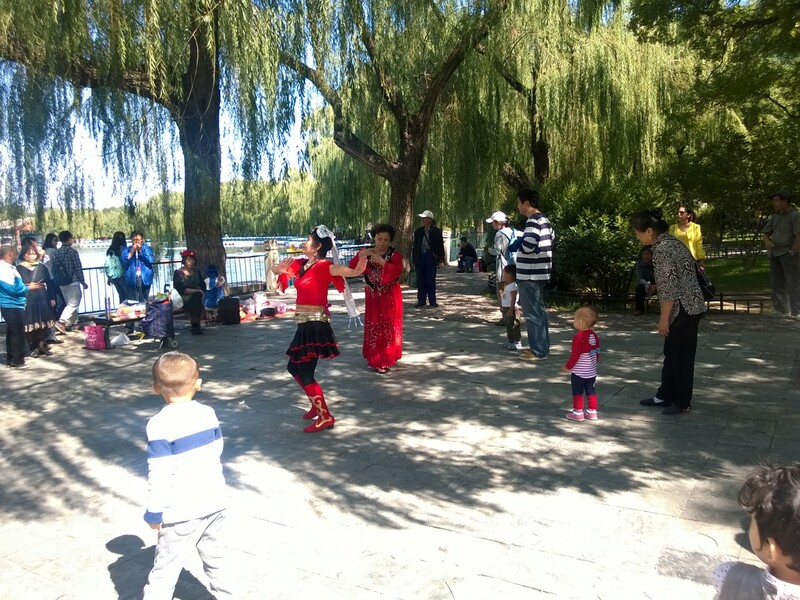 I know it’s cliché but we just had to go to one of the tourist shows they put on in Beijing. 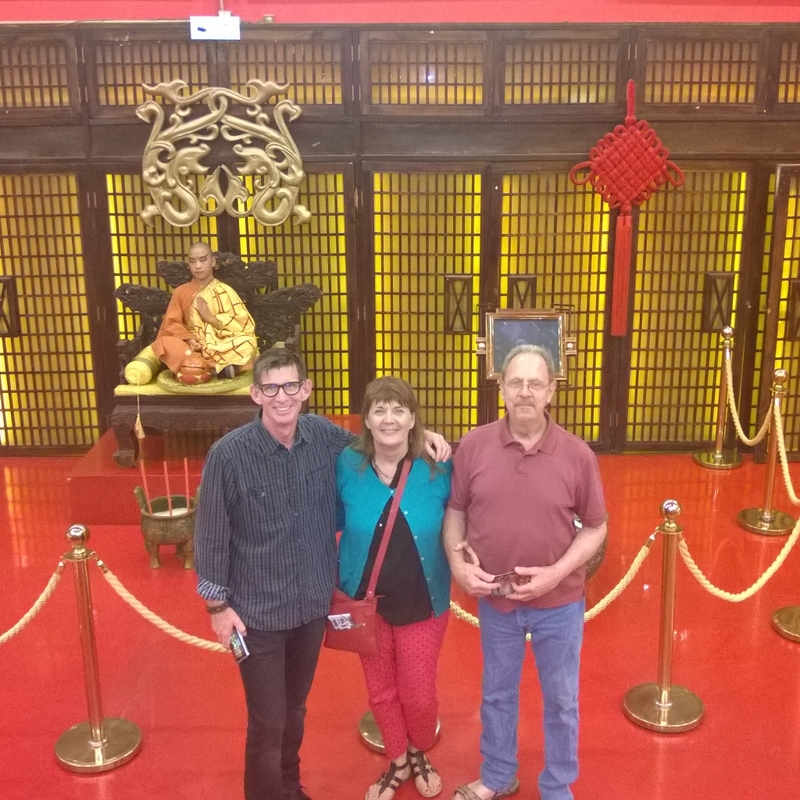 I had a recommendation from a local that The Legend of Kungfu at the Red Theatre was one to experience. So, off we went to check it out. Arriving early (you never know with Beijing traffic so you leave early and hope to get there on time), we wandered the gift shops and took photos of the young boy sitting on the throne outside the entrance. Finding a place to relax on a balcony, Thom and Patti quickly took off their shoes and let the massage chairs get to work on their tired feet after walking all day. Ahhhh…..never mind who else had their feet in their recently, all hygiene was forgotten and pulsating commenced until the show began. We had paid about $55 US for our Row 16 middle seats and, as the primarily Western tour group population filed in, we were quickly surrounded by a full theater. 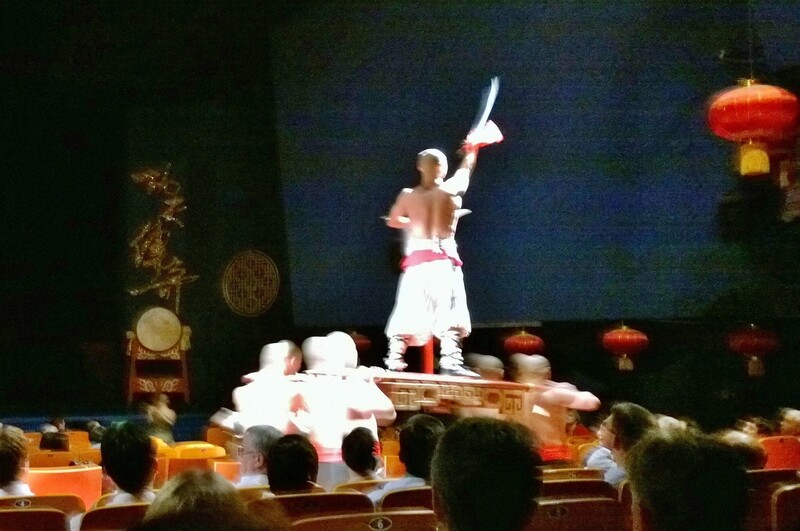 With a pulsating beat on the wood blocks by multiple bald Kung Fu dudes placed around the sides of the theater, the show began with lots of strobe lights, fog and action. The loose story was about a boy being tested by hard challenges and bewitched by a beautiful fairy (why are women always the troublemakers??) before he could practice Kungfu and Zen to become a master and ascend to the sacred goal of enlightenment with the obligatory old dude with super long goatee to champion his efforts and teach him the wise ways of the world. The best parts for me were the incredible acrobatic action between the couple twirling high above the stage by holding only fabric panels and then when he did the feats of various incredibly sharp objects being jammed onto his body. Who knows how they withstand that pressure but perhaps abs of steel??? Looked painful to me but made for good theater and probably some bruises. At the end, you were allowed onstage with the actors to take photos if you bought some outrageously overpriced gifts in the shop. We made haste and just took some photos of the group by the stage and then walked the dark streets begging for a cab to take us home. Amazingly, Thom flagged one down who, of course, had turned off the meter and charged us double for the ride. When in Beijing and it’s dark, you do not argue. You just hand over the RMB and be happy you found a ride. This the hardest blog post I have ever written and I’ve been avoiding it for days. Because, if I don’t write about it, it won’t be true. But it’s time to face the truth and move on. Last Friday, I found out that we would be leaving China two years earlier than I thought. It was sudden news and unexpected to say the least. While I am lucky to still be employed, I almost feel like a part of me has died. 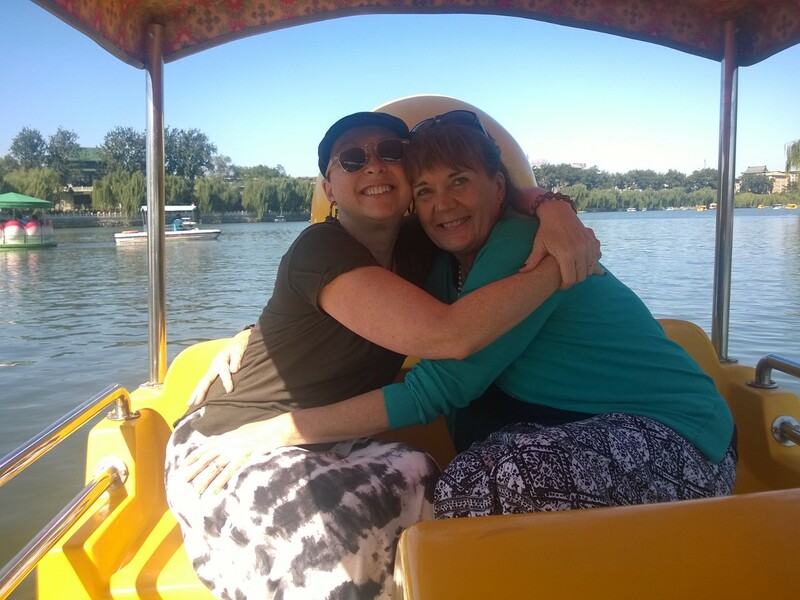 I have so loved this great adventure in China. The unusual, always fascinating world swirling around me daily, as I walk to work and travel with Thom will be ending next month and I am sad. 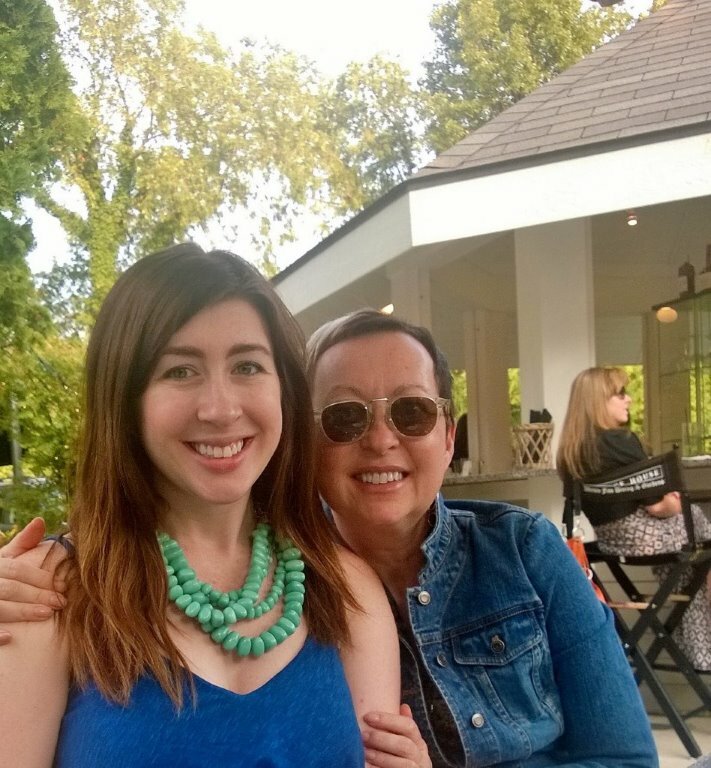 Big Plus to Repatriate-spending time with Hannah! Why didn’t we travel more? Why didn’t I work less? I thought the first year here would be the time to dive deeply into the new job and learn and create and work harder than ever. Then, I could enjoy more of this exotic region the next two years with plans to visit Cambodia, Australia, Thailand, Taiwan, and other parts of China over the many Chinese holidays we are given. 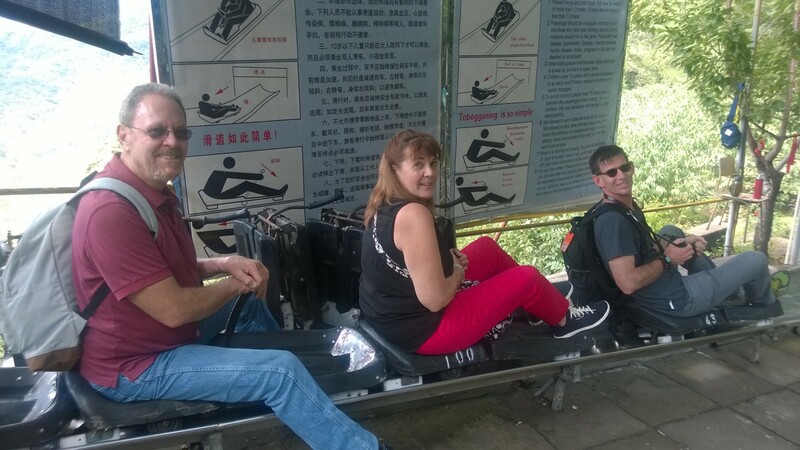 Alas, we have really only seen Beijing, Nanjing and Shanghai plus Hong Kong. 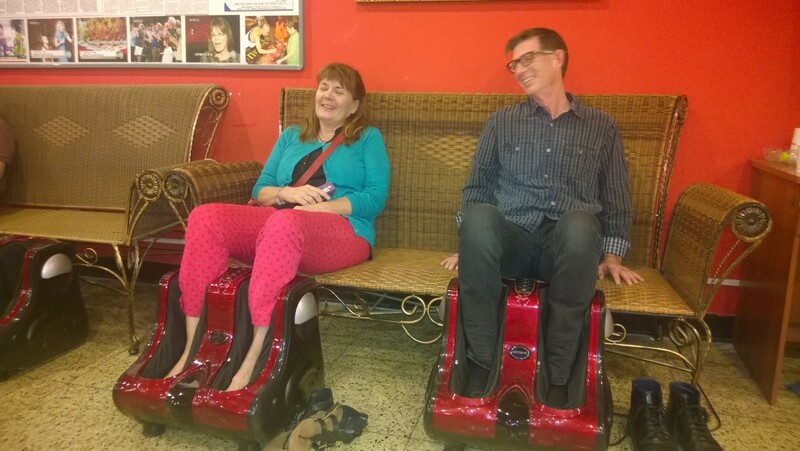 We so enjoyed our visits to Vietnam that I know that other parts of Asia would be equally cool. DAMN. If only…. So, while I am thankful for what I have and the experiences we enjoyed, it is a life lesson to share with all that should be remembered. Enjoy the moment. Live in the day and don’t wait for anything. Yes, you still have to plan for the future but you just never know. 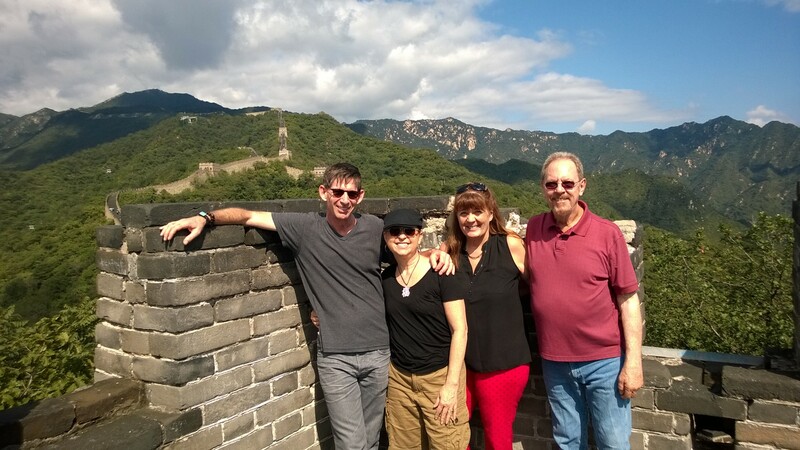 So, the next few weeks while we have our friends, Patti and Larry, staying with us from the U.S., we will conduct the Shanghai Farewell Tour and visit new places as well as say good bye to our favorite haunts around China. This week, I had already scheduled a work trip to Beijing so despite the news, we are still going and I will get to say good bye to the wonderful folks I hired and trained here. 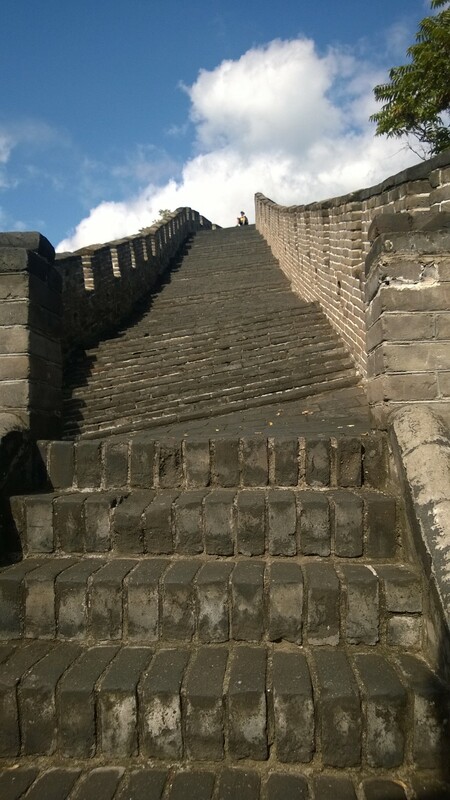 I’ll get to take my childhood friend to the Great Wall (my fourth trip) and we will scream all the way down the toboggan there-one of my favorite things to do in China. We will find a panda somewhere to gaze at and maybe even hold for enough RMB—hoping the Shanghai zoo has a few since Patti really, really wants to see one and we’ll enjoy eating out on our gift certificates to various restaurants that we have acquired and, of course, the VIP massage card. Patti is very willing to help us use up the RMB still left on the massage account. Foot massages galore! So, I will hold back the tears and appreciate everything I have been given. I will look forward to seeing my awesome family more often and spoiling my granddaughter, the beautiful and smart Mia, who is the inspiration for our new online business, Mama and Mia, that we will launch soon with my Hannah creating fashionable headbands that ALL the cool babies will want to wear and personalizing baby quilts from Vietnam and blankets from Uganda—benefitting the women around the world who make them. 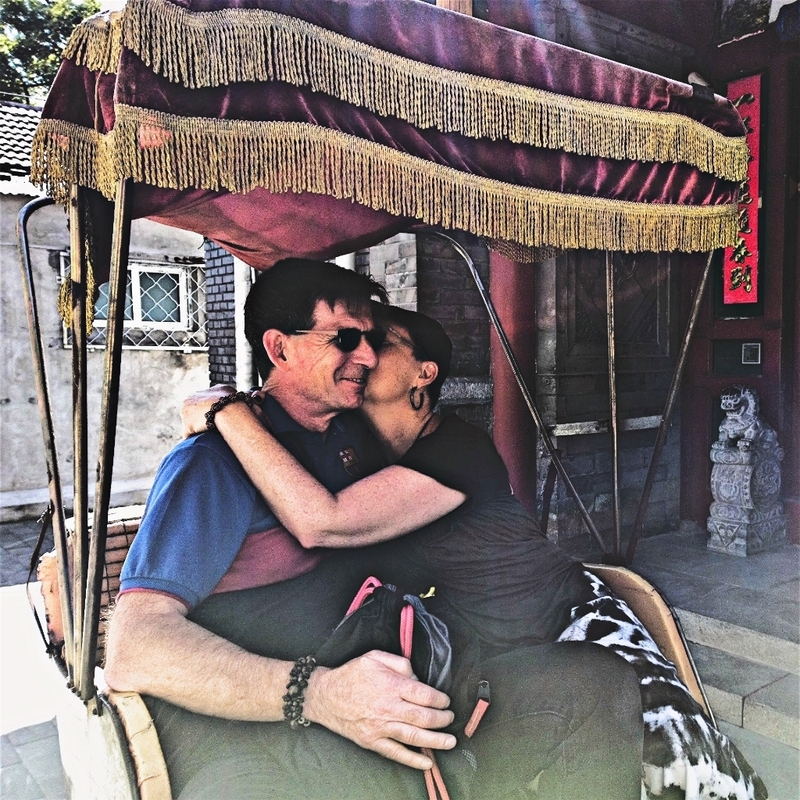 Most of all, I will be grateful that I have had a chance to live in a different culture and understand that the world is a big wonderful place that Thom and I will continue to explore from our Seattle base. While one adventure is ending, many more are just beginning! Watch out world-here we come!